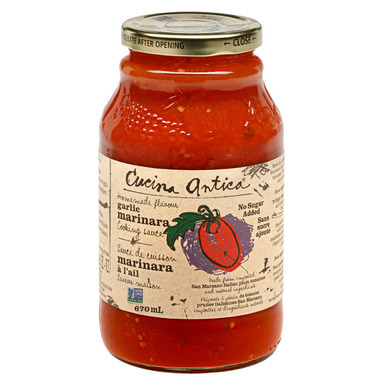 The Garlic Marinara sauce allows the home chef to satisfy everyone in the family, as it is the perfectly balanced blend of Italian San Marzano tomatoes, fresh herbs and spices. Simply allow it to simmer for a few minutes before tossing in your favourite pasta to create a delicious meal. 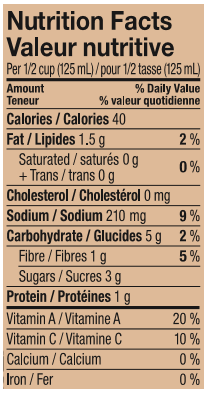 Cucina Antica pasta sauces have no preservatives, no added sugar, no added water and are made with real tomatoes- not paste! Ingredients: Imported Italian San Marzano tomatoes, tomatoes, extra virgin olive oil, fresh garlic, salt, basil, white pepper and black pepper. it was really good! tasted fresh and light yet flavorful!